The Sheridan School held their annual Read Across America celebration on Thurs., March 1. The day was filled with several activities to share and promote the joy of reading. Sheridan High School juniors and seniors read a Dr. 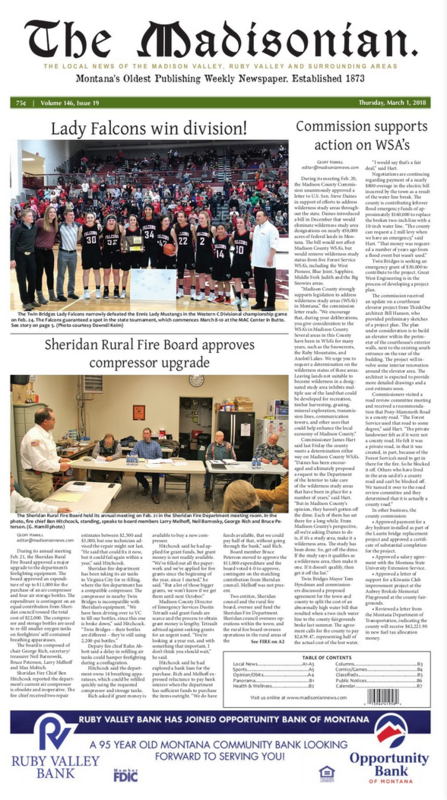 The Twin Bridges School Board met on March 20 for their regular meeting and talked school levies, and heard an update from the Town of Twin Bridges regarding a storm water project. The Ennis School Board held the first official reading of the student drug testing policy during their March 21 meeting. The board must hold three public hearings before the policy can be adopted. Superintendent Casey Klasna has been working toward drafting a policy since late last year, after first bringing it to the board. Ennis joined with FCCLA student leaders, members, and advisers from across the state at the Billings Convention Center on March 18-20 to participate in the annual Montana FCCLA State Leadership Conference (SLC). The Twin Bridges Student of the Month is Savanna Stewart. Sav is a senior at TBHS and will be serving as the Class of 2018 Valedictorian at graduation this coming May 20 at 2 p.m. She will be finishing her high school career with a perfect 4.0 GPA and an acceptance letter from Stanford University. It’s safe to say that things are busy in our area schools, and Harrison Schools is no different. During their March 12 regular meeting, board members were informed of upcoming ski trips, Washington D.C. trips, prom, track season starting, student testing, Easter break, parent-teacher conferences, the school play, and more. Sheridan FCCLA "Be The Change"
For FCCLA, Rachel Zielinski of the Sheridan FCCLA chapter chose the project ‘Focus on Children’. She decided to work with 6th graders to improve their self-esteem. Rachel went into the 6th grade class and presented a PowerPoint and did activities with them. Read more about Sheridan FCCLA "Be The Change"